"Then, Jozef Mazzini had been standing in front of the 110 feet high mooring-mast of Ny Ålesund, an obelisk made of metal struts. Here, Amundsen and Nobile had moored their airships "Norge" and "Italia". It rose into the arctic sky as always." 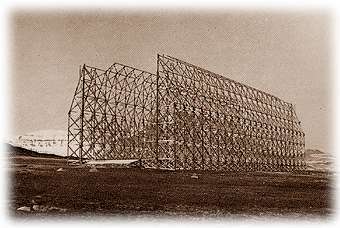 from: Christoph Ransmayr, "Die Schrecken des Eises und der Finsternis"
The picture, taken in 1939, shows the wooden carcass of the big Zeppelin hangar just outside Ny Ålesund, Spitzbergen. It was destroyed during the Second World War. In the pre-war years, local people used to sell pieces of cloth from the decaying building to tourists.